We’re not trying to torture anyone with these sneak peeks. For the past couple of weeks we’ve been playing with new builds of Demigod sent over from developer Gas Powered Games. Now, since I work at Stardock, the publisher, I’m biased. I make no bones about it. But as the designer and one of the developers of Galactic Civilizations and the forthcoming Elemental, I do have some perspective on the work GPG is doing with these demigods. As someone who is biased a bit towards quantity over quality, I have been somewhat skeptical about the effort involved in making these demigods. If I were the designer of Demigod, the players would simply create their demigods from scratch at the start of the game rather than “pick” one. That said, seeing GPG’s work has given me a real appreciation of the craftsmanship at Gas Powered Games. The Demon Assassin will be an exciting addition. He plays very differently than any other demigod I’ve played and yet he also feels natural to the game play. He’s incredibly powerful but also very fragile. I normally play as either Oak or Lord Erebus. In either case, I don’t tend to die often because I quickly amass a lot of HP. The Demon Assassin, by contrast, is (obviously) not a general which means no monks to start out with and he has much lower armor and HP than most of the demigods. On the other hand, he’s lethal. By the second level, a fully mana’d DA can inflict 650HP of damage. Warp Strike. You target at enemy and he will warp in and do 250 damage (it’s expensive at 500 mana so early on it’s not something that will happen much). The range isn’t huge but it’s enough to make him a real force early on if you’re running away. Spine Attack. Yes, he also has a ranged weapon. A rather nasty one. It’s short-range but it’s range nevertheless. For 550 mana you can do 400 damage. First level. Elusiveness. This is a passive ability but holy cow, it’s so cool. It’s a dodge ability. Demon Speed. Another passive ability but simply put, you can make him go faster and faster. By default, he’s actually pretty slow. Precision. This is a critical hit passive ability that you can crank up during the course of the game. Warp area. This is his area effect. It doesn’t show up until level 5 but it lets him do damage to nearby units for 250 damage each (eventually at level 10 he can do 500 damage to all nearby units). He also has a shadow ability. This is the one that will be controversial and we’ll be discussing with players. He can exchange places with a target demigod. The range is limited but it’s very powerful. You’ve just capped that portal flag, you’re running away. You’re going to make it. No. No you’re not. You’re going to die. Because the demon assassin has just exchanged places with you and now you’re back at that portal and he’s out in front of you. He is incredibly dangerous – in the right hands. He’s also a massive feeder in the wrong hands. At level 4, with HP giving armor and such, I had 2275HP. With Erebus or Oak I’d be at over 4000 at that point. What? Give him Blood of the Fallen? No problem? Except he’s fairly slow at the start. He is almost begging for Swift Ankle Bracelet. Here’s a video of his skills. Gkrit, not too shabby hey? Back to the lobby time? Great work SD and GPG!!!! Looks awesome, and is at least sounding like the balancing is getting worked out. 1) Demon Speed is useless especially since Frogboy says he is slow by default. He has too many abilities that warp him around so movement speed may not be required. Sedna has Inner Grace and its better. 2) Critical Strike builds. We're going to see viable builds for critical strike. The favor items are there to support it. 3) Spine Attack may or may not be useless. I don't know yet. It has to consistently cost more mana than Fireball or else it will be strictly better than it. 4) Warp Area and Shadow I need to play around with in game and see it actually used to comment on it. 5) This guy is super mana intensive. He won't be able to viably HP stack his mana costs. He'll need to run Vlemish and Plenor together minimum to pay for those mana costs. Because of this we may see an HP stacking critical strike build. As more information comes out, of course my opinions will be modified. I'm getting excited about Demigod again! This agitates me to no end. "I wanna play with him now!" His AoE might be enough to warrant BotS. 7 creeps x 500 dmg x 0.75 = 2625 mana each wave. If his abilities are meant to be spammed, this might work with them. Since he's slow, this might be a good favor item to help his gank. Sorry, I don't mean to speculate, I'm just too excited. I'm going to triple post. This guy's mana costs are high and his cooldowns are insane for slightly better damage. Torchbearer could royally screw this guy up. I don't want to say he's underpowered, but the thought is crossing my mind. Passive ability builds are going to be dominant if the numbers stay the same. I'm not so sure about that. He can go invincible for 1.6 seconds, swap places with an opponent, and warp. I don't think his damage abilities should be as good as TBs with these in mind. I want to try a dodge build. P.S. Frogboy, can we get a look at the skill in between Spike attack and Elusiveness? There seems to be another skill tree there. Also, what is the level 15 ccombined stat for elusiveness and demon speed? 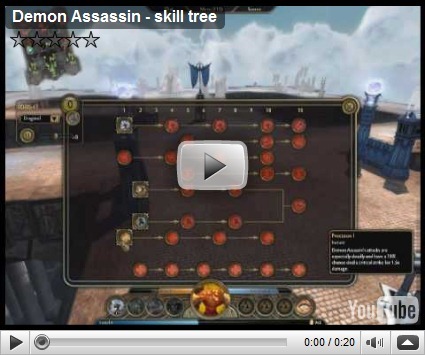 Can you do a mouse-over at the level 10 skills for each skill tree? Ideas are just exploding out of my head. I don't really like Warp Strike as an offensive ability. Its strictly worse than Fireball. How often are you chasing long enough that Warp Strike won't endanger you into dying? This is not going to be a chaser. Fireball does the job better. But then again, I need to see how the damage scales. If you are pursuing two demigods, you can swap places with one to catch the other. The ganking ideas are abundant. P.S. Frogboy, can we get a look at the skill in between Spike attack and Elusiveness? There seems to be another skill tree there. Also, what is the level 15 combo stat for elusiveness and demon speed? Can you do a mouse-over at the level 10 skills for each skill tree? Like I said, I need to see this one in action, but at that level it only does 250? I imagine you need to click your warp locations like 4 times or something and then it goes off. I don't know, that seems a little weak since each target can only be hit once. if i think about how often i used cloack of the night + (sometimes pounce) to kill an enemy demigod i cannot agree with you here polynomial. and no, most times it was without already having pounce on highest rank. Spine Attack 3. 850 mana for 900 damage? How about 540 mana for 1050 damage? I really want to call Demon's active abilities underpowered. But I have not seen them in action. If the numbers do not change, the focus of this guy's builds have got to be the passive abilities. Pounce does more damage, and costs less mana. I wrote down the stats of the skills as comments below the vid on youtube, for those who wanted 2 kno what each skill does. Hmm the spine attack seems to be pretty strong... lvl 1 is 550mp for 400 dmg and lvl 3 is 850mp for 900dmg, so lvl's 2 and 4 are probably... 700mp for 650dmg and 1000mp for 1150dmg??? Also, the passives ( i mean Elusiveness and Demon speed) seem to progress at the same rate, and at lvl 3, they are 15% . Spine Attack level 1 is good. Its basically a ranged Pounce. But it doesn't scale so well the higher the levels get in terms of the mana/damage ratio. I could be totally wrong about all I've said. If you can't tell I'm excited over this. Bring on Occulus! Oh, I just realized that DA's cooldowns are identical to the Magnus Rod's cooldown. Those two will synergize really well together. I would contribute but I was bought with the words warp and invicibility. Honestly, he has so many passive abilities I'm not sure how many of them will actually be used. If you max them out, then you don't have any space for special abilities. I want to try a critical strike with stats AA build. that's why i said sometimes with pounce and i only counted the situations where my pounce is low rank while we are allready at higher levels. so under this cirumstances it is fully comparable to pounce. the mana costs of pounce are irrelevant as the assasin demon may do its dmg prior to that moment otherwise. the point is the situation you said is rare i find quite often. Then you're better off using Sedna and Cloak of the Night if the warp burst is your thing. This is all depending on how Warp Strike scales though. Sedna is more likely come out of that situation alive because of her heal. According to Frogboy, Demon dude has low HP and low movement speed. Wouldn't h ebe like the only demigod with the ability to dodge though? Edit: Ok I mean be more evasive then others, maybe some skills like pounce or fireball actualy have a chance to miss against him. Dodge only affects auto attacks if I recall correctly. Yea but I am kinda of hoping since he lacks speed and hp that a high enough Elusiveness would give him a chance to dodge spells and skills.